Since Jack asked in the comment section of the Bob & Doug McKenzie Wallpaper post, I’ll put the Elisnore cases up for download. 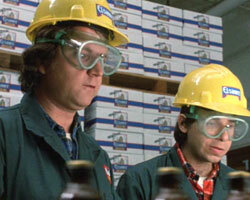 For those that don’t know, Elsinore is the beer company that is the main focus of the Strange Brew movie. 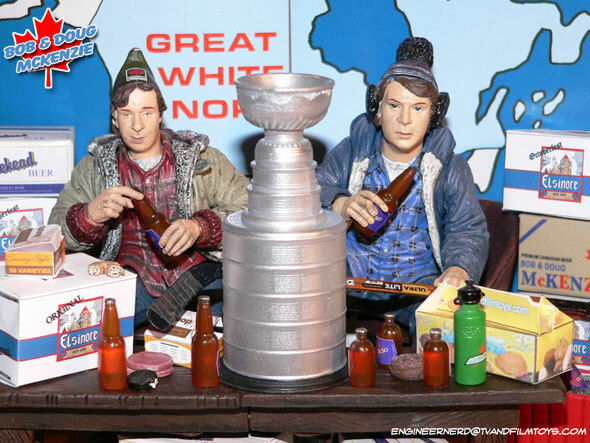 When McFarlane made the Bob & Doug figures, I’m assuming they didn’t have the film licensed and just the characters. So all of the cases of beer are marked with generic names. The bottles say “oslo” instead of Molson, for example. To fill that gap, I came up with these little printable cases. They also help solve the problem that Bob & Doug don’t come with enough cases to really make a picture look full. Now everything comes with a price. The price for this little beauty is negligible eh? All it will cost you is a Tweet!